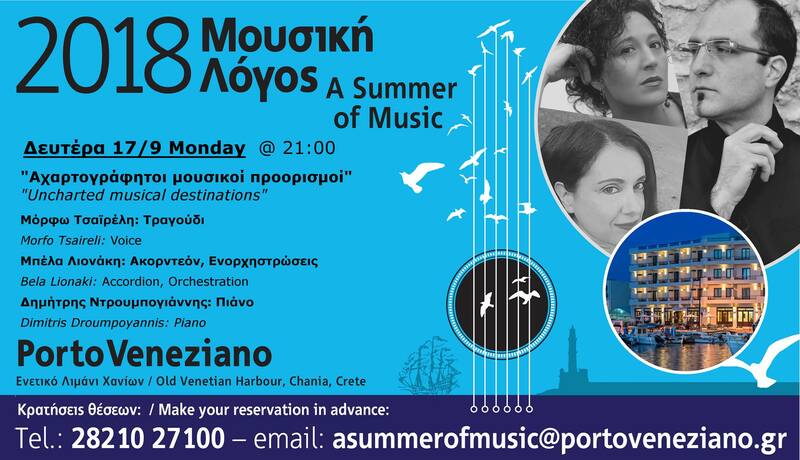 The last concert of the ” Summer of Music”: Three artists performing notable musical creations of great composers, from a broad local and world repertoire. Original songs, with distinct musical “shades”. Entrance: €15. With free selection of your first drink (choose among wine, beer or a refreshment). Due to limited seats, please make your reservation in advance. I'm Austrian living in Tavronitis, love nature, sunsets, the sea, travelling, socialising, good books and more. I came to Crete as a student in the early 70s, exploring the west and southwest of the island with friends by motorbike. When you are young everything is important and , there are lots of things to do...I did. Job, family,children, travelling the world.But I never lost my love of Crete for a minute. And four years ago I ended up in this convenient corner of Crete, not only for holidays, but to stay and haven't regretted it for a minute.